The Fulton Schools of Engineering Career Center is seeking industry professionals to attend one of the two Career Exploration Nights next month. Everyone in the Fulton family is encouraged to extend an invitation to those in your personal and professional networks who have earned a degree in one of the majors offered by the Fulton Schools of Engineering. Career Exploration Nights will be held Tuesday, Oct. 20, 2015 in Tempe and Wednesday, Oct. 28, 2015 at the Polytechnic campus. These events are opportunities for Fulton Schools freshmen and new transfer students to meet and speak with professionals in their chosen fields in an environment that is casual and fun. As our freshmen classes continue to grow in size, more professionals are needed to attend each year. 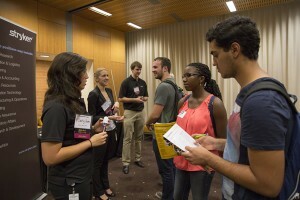 Professional attendees do not have to be an ASU alumnus, and can be in their first position after college, a retiree or a person whose career is anywhere in between. Prospective participants can register on the Fulton Schools Career Center’s Career Exploration Night webpage.